Malt is a very distinctive flavor. For many, it has nostalgic connotations. These malted milk balls, with a smooth, delicious coating of luscious milk chocolate have a satisfying affect on the palate. Once you pop one of these into your mouth and either discover or rediscover their unique texture and flavor, you’ll likely find yourself repeatedly reaching for more. Milk Chocolate (Sugar, Cocoa Butter, Milk, Chocolate Liquor, Soy Lecithin (An Emulsifier) And Artificial Flavor (Vanillin) Malted Milk Balls (Corn Syrup, Whey, Malted Milk) (Malted Barley, Wheat Flour, Milk, Bicarbonate of Soda, Salt) Sugar, Malt Extract, Coconut Oil, Mono And Diglycerides and Artificial Flavor) Gum Arabic, Corn Syrup, Sugar, Certified Confectioners Glaze. One bag contains about 40-50 pieces. I received a sample size of these and they were immediately devoured. They took me back to my youth. My Great Aunt Kate always included these in our Easter baskets. I will be doing the same for my loved ones. They are the perfect flavor bite and you don’t feel weighted down after snacking on them. Buy them. You will be back for more! I will confess to being a malted milk ball snob, although connoisseur sounds much better, and these are as good as I’ve found anywhere and priced fairly as well. They freeze well so I buy in bulk and store them in reused plastic coffee containers. They never come out with that white freezer burn mark by storing them this way although I’ll admit they don’t get to stay in the freezer all THAT long! (A few months at most.) Try ’em… you will be reordering more! 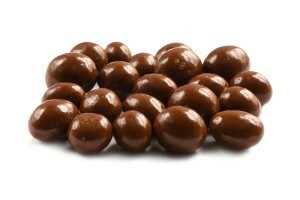 Sweet and delicious chocolate malted milk balls are exactly what you delivered. I will be ordering more; you’ll see. The malt balls are fresh , and taste outstanding. I love chocolate Malted Milk Balls, and these are the best. They were packed just right and when we opened the, they were fresh and delicious. Thank You ! THESE ARE THE BEST, THEY WERE FRESH RIGHT OUT OF THE BAG AND NO NEED FOR STORAGE BECAUSE WE ATE THE WHOLE BAG. I LOVE CHOCOLATE AND THEY WERE PERFECT. BE CAREFUL IF YOU ARE A CHOCOHOLIC THEY ARE ADDICTING, IN A GOOD WAY OF COURSE. These are my most very favorite chocolate addiction in the world. And Nutstop ships them in such a way that you don’t have to worry if they’ll melt or be exposed to much weather. Thank you for keeping them so fresh and perfect!!! My wife LOVES this one.I purchased them for her now she LOVES me even more? These are my weakness. I can’t stop eating them. They are soooo good.